​Due to a lack of student interest, the Residents' Action Council has decided to cancel Sunday, March 31st's Spring Fling Charity Dance. We apologize for the inconvenience. tRAC will still be making a donation to the Cat's Cupboard food pantry to support this important cause, and we encourage Hall Councils to fund raise and do the same! What are the proceeds actually going to from this? I want to go, but how can I pay for this? How do I get to the OU Inn? -Shuttle service will begin at 630pm from Baker Center. What is the Cat's Cupboard Food Pantry? Cat’s Cupboard (formerly Banker Food Pantry) is a new food pantry specifically for Ohio University students who are struggling with food insecurity and acquiring necessities due to emergency hardships. To fund Cat's Cupboard, donations are accepted to provide a room full of food for any student who may need it. It is located in the 5th floor of Baker Center and requires a student ID to swipe in to enter. Upon entering, students are free to pick up food items or toiletry necessities at their own privacy and no questions are asked. In addition, the Dean of Students Office will follow-up with students using the pantry to ensure that they are equipped with all available resources. You can find more information here. 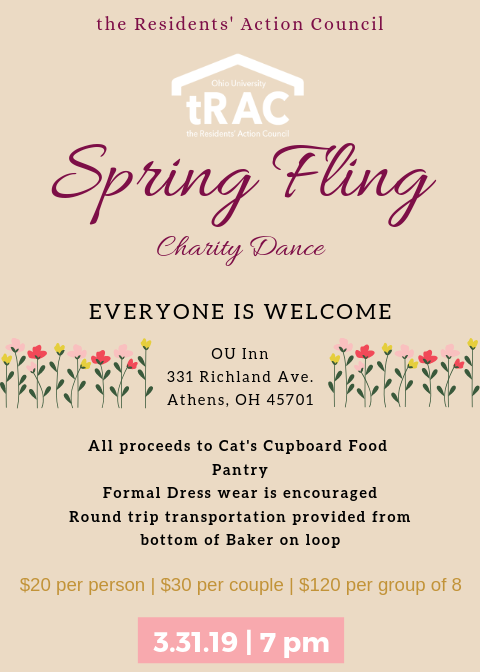 ​This year, tRAC is partnering with Cat's Cupboard to provide students with more food and a bigger variety of necessities for our bobcat family. Consider helping to their cause by purchasing your ticket today!